The Miombo woodlands, which are dominant in subtropical eastern and southern Africa (Angola, Burundi, Botswana, Democratic Republic of Congo, Malawi, Mozambique, Namibia, South Africa, Tanzania, Zambia, and Zimbabwe), are being severely degraded due to intensified human pressure. Encroachment of cultivation and deforestation mainly for charcoal production (Fig. 1) are the major factors that contribute to the decline of these woodlands. Considering the fact that more than 100 million people live in or obtain resources from the Miombo woodlands, and up to 50% of rural poor income in some areas is dependent on the woodlands, their degradation could result in a huge economic and social crisis. Their potential to act as a carbon sink and provide other essential ecosystem services will also be compromised. Fig. 1. An example of deforestation of woodlands for charcoal production. Sustainable management aimed at maintaining high amounts of standing biomass, reducing deforestation and re-afforesting marginal agricultural lands offer possibilities of reducing global warming and maintaining local and regional ecological systems. However, people and governments in developing countries do not have incentives to plan and enforce afforestation and forest protection measures vis-à-vis their demand for direct and indirect forest use. Recently, the United Nations Framework Convention on Climate Change (UNFCCC) has initiated discussions on mechanisms to Reduce Emissions from Deforestation and Degradation (REDD) in developing countries. The REDD concept proposed to provide financial incentives to help developing countries facilitate and enforce voluntary reduction of national deforestation and associated carbon emissions below a baseline. If properly executed, the emission reductions could simultaneously combat climate change, conserve biodiversity and protect other ecosystem goods and services. To efficiently execute incentives and make sure that policies desired to tackle deforestation are implemented, knowledge about the current condition and extent of forest cover as well as the amount of carbon that was stored in those forests is necessary. It is also important to design monitoring mechanisms to assess trends and implement suitable rectification measures. The main carbon sinks in tropical forest ecosystems are the living biomass of trees. The carbon stored in the above-ground living biomass of trees thus typically constitutes the largest pool and is the most directly impacted by deforestation and degradation. Estimating above-ground forest biomass is therefore one of the most critical steps in quantifying carbon stocks and fluxes from tropical forests. 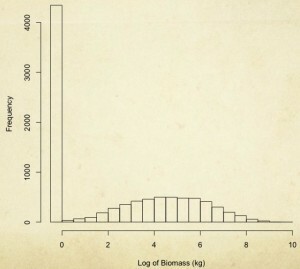 Allometric equations are the most common approaches used to estimate aboveground biomass and carbon stock. Measurements to develop allometric equations could be achieved by direct and indirect methods. The most direct way to quantifying the carbon stored in aboveground living forest biomass is to harvest all trees in a known area, dry them and weigh the biomass. While this method is accurate for a particular location, it is prohibitively time-consuming, expensive, destructive and impractical for country or regional level analysis. Thus, developing tools that can help ‘scale up’ or extrapolate destructive harvest data points to larger scales based on proxies measured in the field or from remote sensing instruments is essential. The indirect approaches involve the estimation of difficult- to-measure parameters, such as stem volume and tree mass, from easy-to-measure tree parameters such as diameter at breast height (D) and tree height (H). However, since it can be time consuming to measure D and H for a large number of trees, other ‘indirect’ approaches utilize equations developed in similar environments and for similar species to estimate biomass. The Africa Soil Information Service (AfSIS) project is well-placed to assess aboveground biomass of trees and estimate their carbon storage potential since it is acquiring a huge dataset for a large number and representative sites across sub-Saharan Africa (SSA). Among the numerous landscape attributes, the project acquired information on number of trees, D, and H, which can directly be used to develop site- and species –specific allometric equations, which in turn will be used to estimate aboveground biomass and carbon sequestration potential. 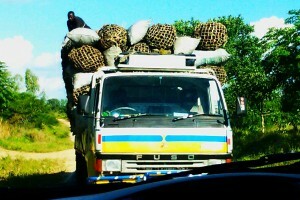 During the recent data analysis workshop in Arusha late November and early December 2011, project team members tried to make use of the available data to gain a general picture of aboveground biomass in Miombo woodlands and assess their carbon sequestration potential. We also attempted to assess the key drivers that determine biomass distribution, more specifically considering Miombo woodlands as an example. where AGB = aboveground biomass (kg/tree); \alpha = model fitted parameter and varying across forest types; d = specific wood density (g/cm3); D = trunk diameter (cm); and H = total tree height (m). The general form of allometric equation shown can be expressed in various forms mainly depending on the prevailing relationship between D and H.
The preliminary analysis results for part 1 presented here are thus based on the ‘dummy biomass’ variable created as the presence of biomass. Though the equations used and models developed will require further testing and proper calibration, the results in Fig. 3 can be considered plausible. Further analysis is being conducted to compare different allometric equations and develop suitable modes that can help estimate Miombo woodland biomass as well as other forest ecosystems in SSA. Fig. 4. 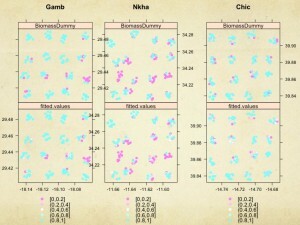 Measured and predicted biomass for three examples sites (Gamb=Gambissa in Zimbabwe; Nkha= Nkhata Bay in Malawi; and Chic=Chica-b in Mozambique). 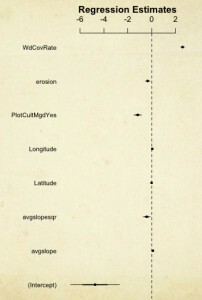 Figure 4 shows the correspondence between ‘measured’ and ‘estimated’ values, which generally shows very good performance of the model developed in this exercise. In all the cases (results plotted from three example sites in three countries) there is very good agreement between field-measured and predicted biomass for the Miombo woodlands in Southern Africa. Application of other alternate equations that have been developed for the region and more specifically for Miombo woodlands will further improve model performance. Despite the fact that model-based biomass estimates show good agreement with measured values, the results presented in this study should be considered tentative, as this effort was only intended to demonstrate the possibility of using allometric equations to assess biomass and estimate carbon storage potential. Additional equations and models will be used to develop appropriate models. Chave, J. and Andalo, C. and Brown, S. and Cairns, MA and Chambers, JQ and Eamus, D. and Folster, H. and Fromard, F. andHiguchi, N. and Kira, T. and others. 2005. Tree allometry and improved estimation of carbon stocks and balance in tropical forests. Oecologia. 145:1, pp. 87-99.